The Lung Cancer 2019 Summit was held Friday 22 February at RACV City Club, Melbourne. 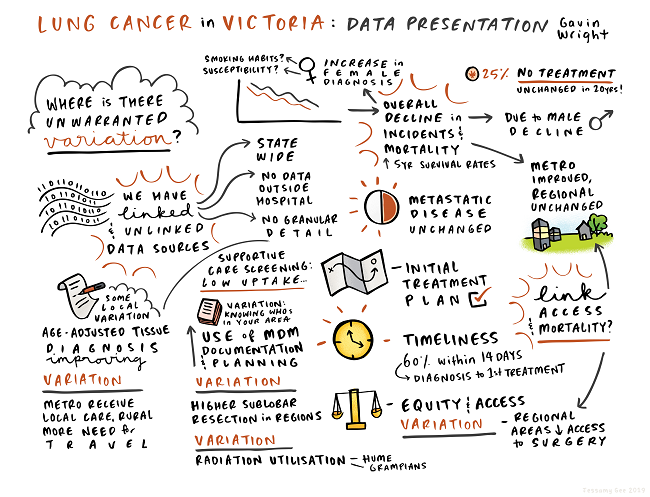 The summit was an opportunity to review data on patterns of care for lung cancer in Victoria, and if there has been a shift towards optimal care in the areas highlighted at the first summit in 2014. The summit showcased examples of clinician-led improvements and a facilitated discussion on where to focus future improvement efforts. 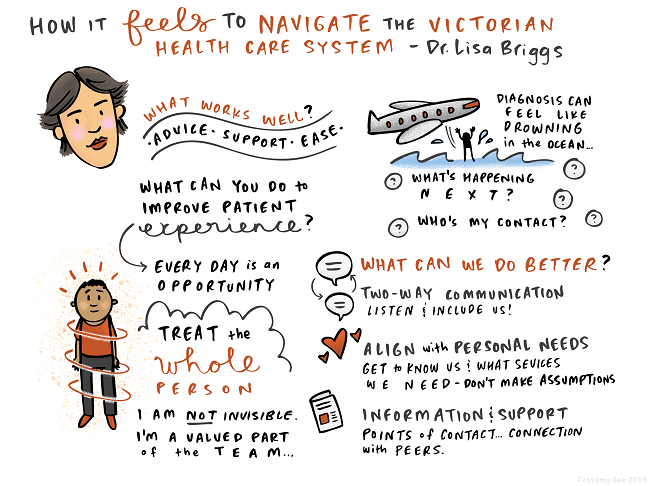 Opening presentation: How does it feel to navigate the health care system in Victoria? Dr Lisa Briggs is an osteopath and exercise physiologist. She is a passionate patient advocate who has been living with stage IV lung cancer for four and a half years, and offers these suggestions for improvement. Lisa opened the summit with a 13-minute video presentation, sharing cancer treatment plan experiences of Victorian lung cancer patients and carers. Ms Melissa Arduca, Acting Assistant Director of Cancer Strategy & Development, Department of Health & Human Services, spoke on the policy context of the Lung Cancer 2019 Summit. There is still work to be done to ensure equitable access and outcomes for cancer patients in regional and lower socio-economic areas, as well as Aboriginal and Torres Strait Islander (ATSI) communities, and to reduce variations in outcomes between tumour streams. The goal of this work is to give all patients timely access to the best care. Optimal Care Pathways for ATSI communities are now available. Highlighting the Lung Cancer Framework, a national resource for health professionals and service providers to support local adoption of delivery of best practice, is in alignment with nationally-endorsed optimal care pathways is a reminder that Australia as a whole is engaged in a long-term and ongoing effort to shift to optimal cancer care. The current iteration of the Victorian Cancer Plan (2016–2020) has five priority action areas: prevention, screening, early detection, treatment and wellbeing, and support and research. 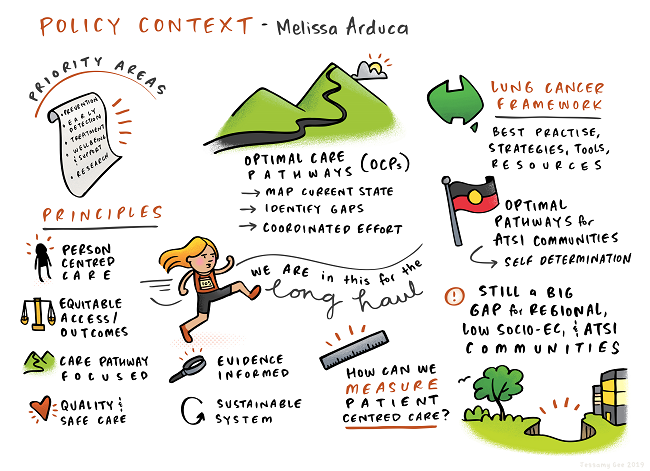 These areas are underpinned by principles in person-centred, prevention-focused and evidence-informed care, and sustainable systems and optimal care pathways. Victorian Tumour Summits inform part of the work done to implement and redesign optimal care pathways. Redesign grants, to assist with implementing the lung optimal care pathway, were informed by the Lung Cancer 2014 Summit. 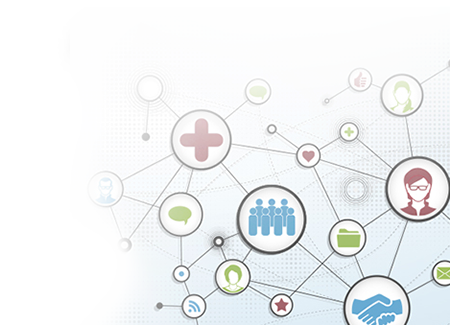 One such program of work was the health pathways electronic referral system. A collaboration between Integrated Cancer Services and primary health networks, the program took information from the lung optimal care pathway and incorporated it into the health pathways website — an evidence-based tool that helps GPs assess, manage and refer patients into tertiary care. Associate Professor Gavin Wright presented on patterns of care for lung cancer in Victoria (2013–2016). This summit focused on facilitated small group work discussion of variations presented, in order to determine if variations are unwarranted and plan clinician-led local action for improvement. Summit data showed there is an overall decline in lung cancer and mortality but an increase in female lung cancer. Five-year overall survival has improved to 18% (2015), with a higher survival rate in metro areas. Fifty percent of lung cancer diagnoses are still stage IV. Overall tissue diagnosis has increased to 91% (2016), with a goal of continuing this upward trend. Documented MDM discussion of patients has an increased statewide average of 69% (2017), with a target of 80%. Documented supportive care screening has a low statewide average of 52% (2017). Further data is available in the video below. As a repeat summit, the data presented can show where lung cancer care in Victoria has and has not improved. Data only shows variations — further local investigations of variations to determine if they are warranted or unwarranted is required. Recommendation is for more quality indices, such as appropriate targeted immunotherapy with target tests. Approximately fifty percent of all diagnosed patients have metastatic disease, regardless of region. It is still difficult to safely use tissue diagnosis in patients aged 85 and above. This will be difficult to improve other than by advancing minimally invasive techniques. Below 75 years of age, the state average for tissue diagnosis is good. There has been improvement in tissue diagnosis rates in SMICS and GICS. MDMs are a feature of high level cancer care in Victoria. Randomly selected histories were audited for 2017. Documented MDMs in in GRICS, HRICS, LMICS and GICS were below the state average. WCMICS was below the target of 80%. Given the small sample size of the audit, further local investigation is required.Minimal retrospective MDM discussion is desired, and there should not be significant variation in the rates of retrospective MDM discussions across the state. Ninety percent of treatment plans are going to GPs — the aim should be 100%. Sixty percent are getting surgery within 14 days. There is a statistical trend demonstrating a slow improvement in timeliness. Hospitals use a 30-day rule for a Category 1 patient on a waiting list. There is no statewide imperative in practice to work to a 14-day rule. This data is for patients recorded as non-metastatic within one month before and four months after surgery. There is variation in access across the state. This could be a variation due to patients' staging diagnosis, but we cannot get this detail from the data we currently have. There is better survival for patients treated in a metropolitan region. It appears the less access patients have to surgery in a region, the lower the survival for non-metastatic patients. This could be an issue for local investigation. Survival for metastatic patients does not vary significantly across the state, although it could be worth investigating access to chemotherapy in GICS. Survival for non-metastatic surgical patients was similar across the state, indicating if there is an issue, it may be with access to care, not quality of care. There is statistically significant higher volumes of sub-lobar surgery in regional centres than metropolitan centres. It may be worth considering if patients should receive surgery in metropolitan centres. There has been a reduction in low-volume lung surgery, however, there is still a 'tail' in some regional and private hospitals that requires local investigation. HUMERICS has lower use of radiation. GICS and BRICS could investigate variation. There are some campus outliers in time from diagnosis to radical RT/CRT — two regional and one metro. GICS has a higher rate of small cell chemotherapy utilisation. HUMERICS has a data limitation. State average for referral to palliative care is 35%. Do we need to 'aim higher'? Ken from opr Agency on Vimeo. The 2014 Victorian Lung Cancer Summit yielded improvement opportunities in lung cancer care as identified by the 60 multidisciplinary clinicians in attendance. Following the summit, the lung tumour stream was prioritised for the Optimal Care Implementation Program, a coordinated improvement program of work across eight Integrated Cancer Services and six Victorian Primary Health Networks. In 2016, grants for Victorian public health services were made available to support improved timeliness of and access to lung cancer treatment. The Victorian Lung Cancer Service Redesign grant assisted hospitals to develop systems and measures that target improvements in the timeliness of lung cancer care. Alfred Health, Bendigo Health, Eastern Health, Goulburn Valley Health and Albury Wodonga Health were successful in obtaining a redesign grant in 2016. Austin Health, Barwon Health, Ballarat Health and Monash Health received additional Department of Health and Human Services funding and ICS support to participate in baseline and final data collection, as well as service redesign activities. The DHHS has funded the Victorian Lung Cancer Registry to support a standard approach to data collection and evaluation from these sites. Most projects are expected to embed their new practice into current standard operations at some point this year. Professor Robert Thomas, Chief Cancer Advisor Department of Health, opened the event highlighting the importance of clinical networks to drive statewide improvements in cancer care and outcomes. Professor David Ball, chair of the lung summit working party, presented available data about the current state of lung cancer care and outcomes in Victoria. A summary of key measures was available to participants as a quick reference.